Quit your job to improve your finances - The Leveraged Mama. So Mama, you think you can’t possibly quit your job. You’re unhappy – for whatever reason, maybe it’s because your kids are still pretty young and you’re exhausted juggling working and parenting. Maybe it’s because you’re not performing as well in your job as you did pre-kids. Or perhaps, you just really want to spend more time with your kids! But you’ve done the numbers (a few times), and you can’t see how you can possibly quit your job, because there will be a shortfall of money and you don’t want to go into (more) debt! So how is it that I can sit here and tell you that quitting your job will be good for your finances? I’m probably correct when I say that you didn’t always earn what you do now. Your household income has probably increased over the years, but so has your spending. That’s called Lifestyle Inflation. It’s a little bit like when you’re given a deadline to complete something – you’ll finish the task by the deadline. If you are asked to finish the task sooner, or later – you’ll make it happen, perhaps rushing a little or starting late. The point is, often the time we spend doing something is directly correlated to the time we’ve been given to do something. Time expands to fill the space. In the same way, the more you earn, the more you spend. Sure you might be saving more, or paying more onto the mortgage too, but you’re also making more and larger purchases because, well because you can. What happens here is that you set expectations – for yourself, your family, and the people that know you. Peti takes a holiday every year. She must be doing well. Peti’s kids do well at sports – they always get their kids along to the games. Once expectations have been set, they only increase as your lifestyle inflates. But you’re not only setting expectations of others – it affects your kids and partner too. And further to that, their friends have expectations of them too. But why are expectations even a problem? It’s easy to please someone if you exceed their expectations. But after a while, that little bonus, that little surprise, becomes an expectation. If you exceed someone’s expectations, you delight them. If you meet someone’s expectations, you don’t make them unhappy – they just feel kind of average. If you don’t meet someone’s expectations, you make them unhappy. You can see how easily our expectations increase over time huh. I’m sure you’ve guessed this already, but what’s the first thing you do when you try to spend less money? When you stop meeting expectations, you start making people unhappy. Yourself, your family, your loved ones. I know you don’t like to disappoint your loved ones. But if you are in debt, or you’re not meeting the financial goals you have for yourself, a little bit of disappointment is going to be inevitable if you want to get back on track. Start slowly lowering expectations now. The thing about people is that we adapt to change. We don’t necessarily like change though. So we kick up a fuss! We rebel. We complain. And you know that’s going to happen when you start cancelling holidays and cut down on the kids activities. If you start slowly resetting expectations now, it will give your loved ones time to adjust slowly. “Next term, you can choose one sport to really focus on.” “This year we’re cutting our carbon emissions and holidaying local.” And so on. They’ll still probably kick up a fuss when the time comes (so might you), but it won’t be as bad as if you spring it on them at the time, trust me. How do you know which expectations need to be lowered? Okay okay stop freaking out, I don’t mean quit your job for real. I mean quit your job theoretically. Then, redo your budget based on your lower income (yes, I’m assuming that you have a partner and they’re still working). 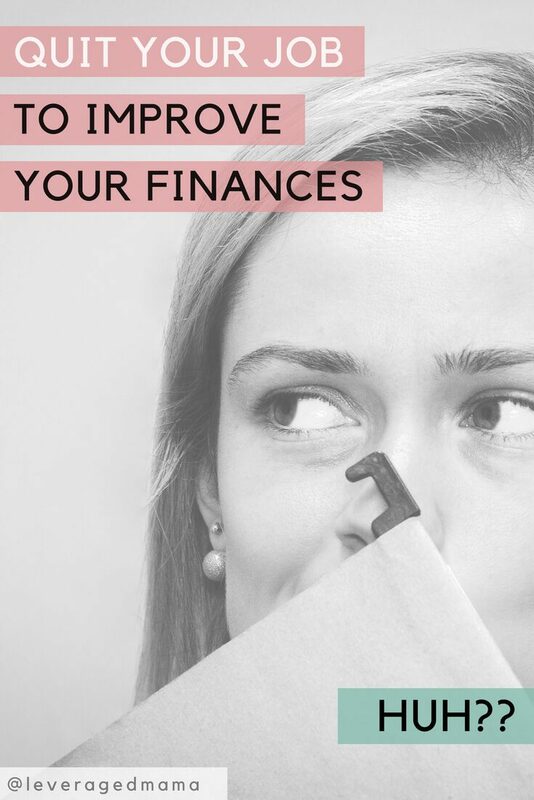 That’s going to leave you with the dreaded shortfall – the difference between budgeted income and expenses – but you can now start tinkering with your budget to see how you’re going to make it work. I didn’t say this would be easy. Or fun.  We’d have to cut the grocery bill by $500 a month! 浪 No more after-school care! Cause I wouldn’t be working! Remember, this is a theoretical exercise. For now. But what you’ll end up with – regardless of whether you quit or keep working – is insight into your lifestyle inflation, and the expectations you’ve set – for yourself, your family, your loved ones – because of it. Yup, I just quit my day job so that I can focus more time on myself and my family. And to be confident giving up a third of our income, I had to do this exact exercise (a number of times). Food and drink is our major money leak so I knew we would have to make some reductions. I’m not gonna lie, it took a loooong time to manage my husband’s expectations around how much we could spend on food and drink. Moooonths. But like I said, slowly slowly. It helped a lot that I’ve been tracking our household spending with PocketSmith and Tiller for quite some time now, so I can show my husband how much we spend in each category every month. This really helped me to ‘present my case’ to him – that we were spending enough on discretionary items, to be able to cut back without starving! “Babe, I’m basically working so that we can line the pockets of Wellington’s grocery stores and cafes” and then I backed it up with REAL DATA. Undeniable. Once he saw it, he couldn’t un-see it. What’s the first thing you’d reduce spending on if you quit YOUR job? What expectations do people have of you, or do you have of yourself in this area? Could you start lowering expectations now, and start spending less right now? Theoretically quitting your job might will help you improve your finances, because it gives you insights into your own Lifestyle Inflation and the Expectations that you, and your loved ones have because of it. Great blogpost Peti, took me back to when I made th decision to quit too and yes it ended up happening when I took maternity leave. Though we didn’t reset expectations enough – something we’re doing more now! Great post Peti. So true that the more we earn the more we spend on lifestyle and often not even realising it. Good on you for working through the steps you needed to in order to leave your job. I love this Peti as it’s so REAL! Love that you walk your talk 100%. Wonderful advice. All based on personal experience 😁 thanks Bronni! Totally resonated with me Peti! After going on maternity leave and not working for 12 months we as a family realised what we could survive on. It was far less than we thought which was the catalyst for me quitting my job too! Great post! Peti – this is spot on. Lifestyle inflation is huge, and often we have no idea it even exists or how much we’re beholden to it until forced to take stock. Great blog. Thanks for sharing your story. Really great blog Peti! We are having to go through this now too. Not because I quit my job but because husband quit his 😱 I’m kinda freaking out to say the least. But I know we can do it. Time for us to reduce our lifestyle for sure. Which you know I think is SO COOL! Yes I believe in you too! Fantastic blog Peti, makes total sense! And good on you!